Born: As Timothy James Curry on April 19th, 1946 in Grappenhall, Cheshire, England. 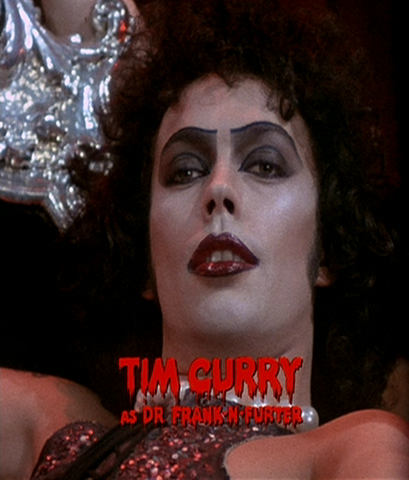 Tim Curry is synonymous with Rocky Horror, for many people. He originated the role of Dr. Frank-N-Furter on stage in the Original London Cast of The Rocky Horror Show. When the play was first produced in the U.S. at the Roxy Theater in Los Angeles, Tim Curry was the only original cast member to reprise his role there as well as on Broadway in its short-lived run at the Belasco Theater. He then made his famous film debut as Dr. Frank-N-Furter in The Rocky Horror Picture Show (1975). This helped greatly to launch Tim Curry's career, and he has since gone on to become a widely acclaimed actor and singer on stage and screen as well as a prolific voice actor. Cold Blue Steel And Sweet Fire - Words and music by Joni Mitchell. Professional Pirate by Tim Curry & Company - Lyrics by Cynthia Weil with music by Barry Mann, for Muppet Treasure Island (1996). Sailing For Adventure by Tim Curry & Company - Lyrics by Cynthia Weil with music by Barry Mann, for Muppet Treasure Island (1996). Simple Twist Of Fate - Written by Bob Dylan. Previously unreleased live version of song on the Best of Tim Curry CD. The Ballad of Davy Crockett - Lyrics by Tom Blackburn with music by George Bruns. Performed by Tim Curry for Disney's Music from the Park CD. Toxic Love - Written by Thomas Dolby for FernGully: The Last Rainforest (1992). Performed by Tim Curry as Hexxus. Birds Of A Feather - Written by Carole Pope and Kevan Staples. I Will - Written by John Lennon and Paul McCartney. Anyone Who Had A Heart - Written by Burt Bacharach and Hal David. Out Of Pawn - Words and music by David Lasley and Lana Marrano.